Are you organizing a team meet-up this season? Are you looking for an exciting Policy & Practices challenge? Would you like to work with science museums, think tanks, and other institutions in Europe and around the world? In association with the Rathenau Instituut. A new calendar will be available every month with helpful dates and information to help you stay organized. Get to know the Registry! 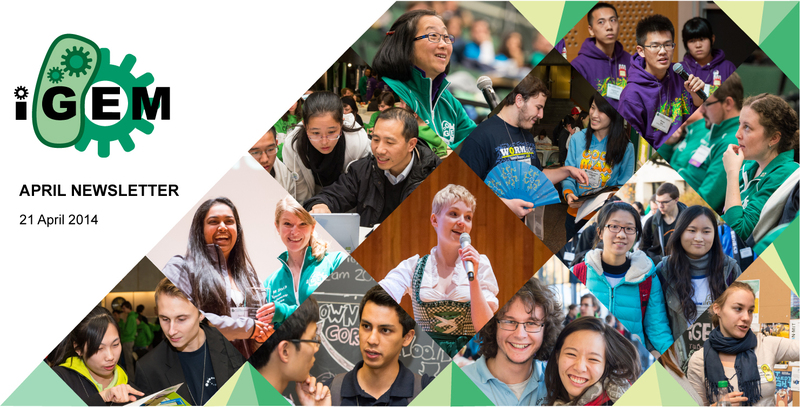 Have you registered for iGEM 2014? The next step is to start brainstorming project and part ideas. One of the major resources for conducting your work throughout the summer will be the iGEM Registry of Standard Biological Parts. In this newsletter, we will share some highlights and useful tools as you prepare to receive the 2014 Distribution Kit and begin working in the lab. 2014 DNA Distribution Kits are being manufactured and are scheduled to ship at the end of April. Stay tuned to parts.igem.org and 2014.igem.org for additional information. Not part of an iGEM team but interested in standard biological parts? No problem! Just enroll your academic lab in the iGEM Lab program. The iGEM Registry of Standard Biological Parts is the world's largest collection of open source genetic parts or BioBricks®. These BioBricks all meet an established standard to ensure compatibility between parts, allowing them to be assembled together, mixed and matched to build novel devices and systems. With over 20,000 specified parts in the Registry, there is a wealth of information available to iGEM teams and lab groups. How do you find what is most useful? How do you see what is available? Registry’s Catalog of Parts & Device. As an iGEM partner, MathWorks will provide software and technical support to all iGEM teams that request it. For more information,click here! Go to our DNA Synthesis Page and just put in your part or sequence. You can add the BioBrick ends and it will even check for RFC 10 compatibility in your sequence! We recommend using IDT to synthesize DNA. iGEM has partnered with LabGenius to bring you better plasmid mapping tools. With LabGenius Plasmid Visualization you can now see how parts and plasmid backbones look as circular DNA. Simply click on the ‘View Plasmid’ link on a part's Design Page to view the plasmid map. The Registry is a continuously growing community collection of parts that runs and grows on our ‘get, give & share’ philosophy. iGEM Team and Lab members get parts from the Registry. They give back to the Registry Repository their new parts, devices, and systems and share their data and experiences with the iGEM community. Our iGEM Lab program allows any academic research laboratory to request parts from our growing Registry free of charge. Just enroll in the iGEM Lab program here and start requesting parts today. Have more questions or new to iGEM and the Registry?